Sometimes you want to go back in time to a web page you viewed on your iPhone a few hours ago or even a few days or weeks ago. Thanks to Safari’s History feature, you can do just that. 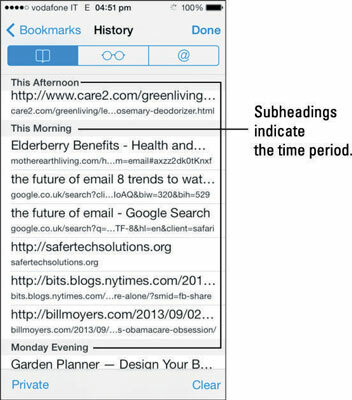 To view your Safari web page history, tap Bookmarks, and then tap History to view your web history activity. Safari lists the web pages you’ve visited in chronological order, with the most recent at the top of the list. Subheadings indicate the time period, such as This Afternoon, This Morning, Monday Evening, and so on. This can help you find the web page you want to revisit — book reviews, hmm must have been Sunday morning, or that sort of mnemonic trigger. Scroll through and then tap a listed item to revisit that web page. If you don’t see the History folder, that means you previously navigated to another Bookmarks folder; tap the Bookmarks button in the upper left corner, or swipe right, to back your way out of whatever folder you’re in until you see the History folder, and then tap the History folder to view your Safari web history. Or you may be in Reading List, in which case tap the Bookmarks button at the top of the screen. To see your most immediate viewing history, tap and hold the previous button. Clear: To erase your entire Safari web page viewing history, tap the Clear button in the lower left corner. The red Clear History button appears, giving you a moment to reconsider whether you really want to wipe out your web history. Tap Clear History if you really do, or tap Cancel if you change your mind. Open pages in tabs and bookmarks remain but your history is wiped out. Private: This option cancels history before it happens. As you go from web page to web page, Safari develops instant amnesia and doesn’t remember where it’s been. When you tap this button, you have the option to Close All or Keep All of the open pages in tabs. You know Private is turned on because the Address/Search field and Toolbar background is dark gray, the Previous and Next buttons are inactive, and when you tap either Tabs or Bookmarks, the Private button in the lower left corner is highlighted. To turn the privacy function off, tap the Private button again. If you have open tabs, you are asked to Close All or Keep All.